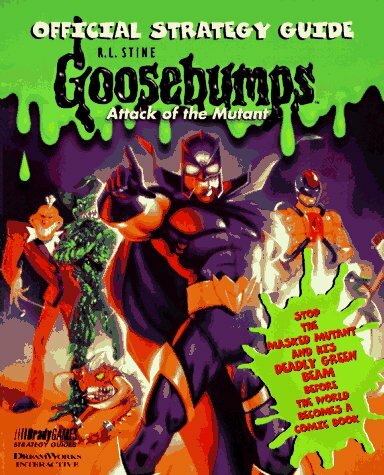 Goosebumps was a huge hit in the 90s releasing tons of books and spanning a successful TV show on Fox Kids which adapted almost every book of the original run in 74 episodes. Sadly the show came to an end but I can’t say it didn’t accomplish more than I would’ve thought. Even then if you’ve watched every episode you might have an itch for more than not even the movies can get to and luckily I’ve found just that to watch. 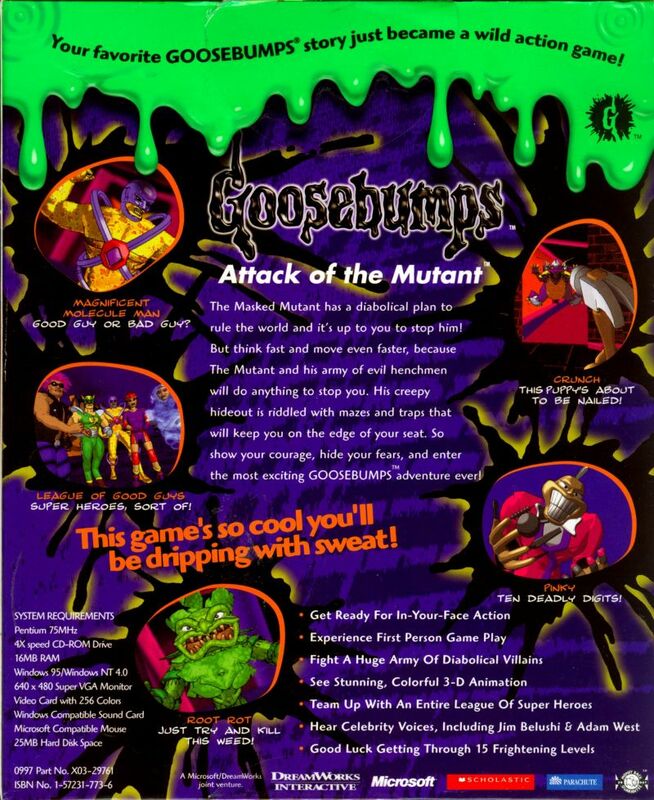 As mentioned Goosebumps was huge and of course it got plenty of merchandise including video games, and we’re not focused on that exactly but the story of them since they serve as nice extra episodes of the franchise that you can enjoy if you’re tired of watching the same episodes over and over again with the same cheesyness that the original show had and we have a total of 3 “extra/lost” episodes, two featuring Horrorland and one the infamous Mutant from Attack of the Mutant. First we have what serves as a sequel to the two-part episode One Day at Horrorland, this point and click adventure tells the story of what happened to the family after they escaped Horrorland and basically the Morris family is sucked back into it. The game is point and click and looks rather fun and interactive which makes watching this hourlong “movie” easy, we get to see the costumes from the show but also more elaborate ones and other guests like a Mummy and even Jeff Goldblum as Dracula. We get to see more of horrorland which the show never gave us a great look at it and hey had a decent budget compared to the show and features its own twist ending. While meant to serve more of a sequel to the book it actually works pretty well as a sequel episode to the original episodes. The actors are different, biggest difference being the sister looks much younger. Clay is a friend who only appeared in the book and he is in the game, luckily they mention he’s a friend and don’t reference that he was in the previous event so it fits with the show. We get to see the owner of Horrorland but that doesn’t break continuity either as we only saw the host of the show and not the owner of Horrorland before. While having the same name as the book and tv show episode it’s actually not a re-telling of that story as it’s an all original adventure. It begins similarly with a missed bus stop but that’s where it actually ends. 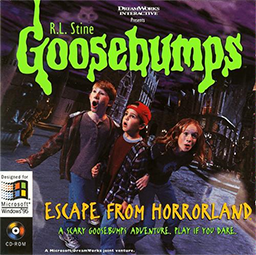 This game actually features the Goosebumps song which only made it feel more of a bonus episode. Sadly the story is not that spooky themed and plays more like a superhero game since in it you want to help the league of superheroes defeat the evil Mutant and his army since they want to turn the world into a comic book, the player having the ability to move between the comic world has to find his costume to become a hero and help destroy the mutant. Sadly we don’t get a twist ending here and not a lot of spooky going on in it, still fans of the Mutant should check it out. The actual game looks really cool having celshaded animation, it’s a bit of a point&click and FPS hybrid in the way it plays. Adam West who played the evil Mutant in the Goosebumps show also appears in the game but sadly he doesn’t voice the mutant who has a more sinister voice and instead voices one of the heroes, still nice to see him in the game even if not reprising his role. Even if the story is not that scary you will get a few jump scares even in this bright comicbook world. 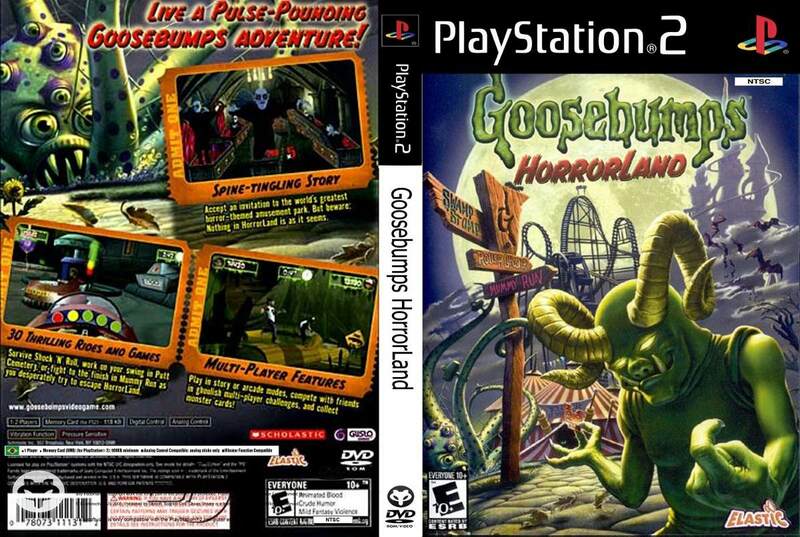 Finally we return once more to Horrorland for Goosebumps Horrorland, this game for PS2 and Wii released much later after the original craze of goosebumps had passed but was seeing a small revival. 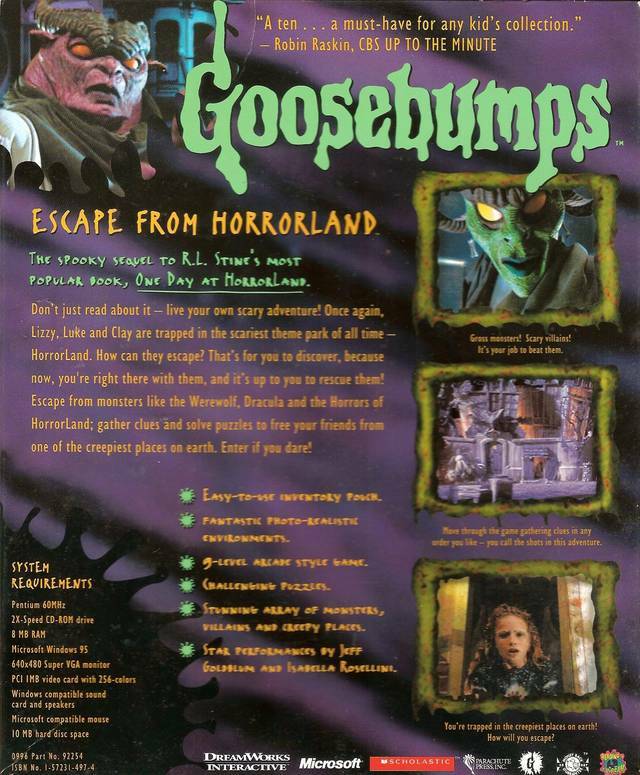 The game is mostly mini-games which were popular at the time with the Horrorland theme, sadly it’s all themed only for Horrorland and no easter eggs for other monsters of Goosebumps. While totally unrelated it does serve as a CG episode of Goosebumps so why not, it might not be amazing by any means but it’s only a few minutes long. To really get the most out of the story you need to watch someone play through the whole game which you can watch here, but unlike the previous two examples here the game doesn’t last only an hour but a few hours which makes it a tough bargain. The 10 minute version of only the cutscenes gets the job done but the problem is the FMV lacks some information that you only get to see by playing the game such as Horrorland having different owners and what not which helps the flow of the story and the final twist. 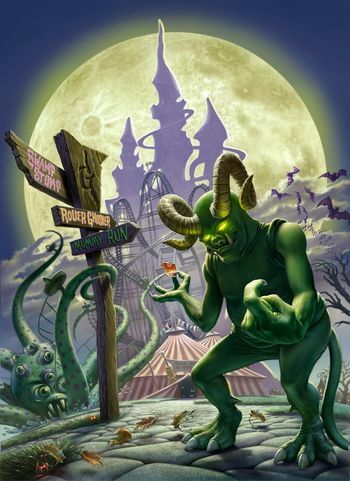 The mini games might not have been the best but they do get the idea of Horrorland for the most part as does the dialog. For a cheap cash-in game I am impressed. Overall none of these “lost” episodes are particularly great but they do give us another tale in this universe.